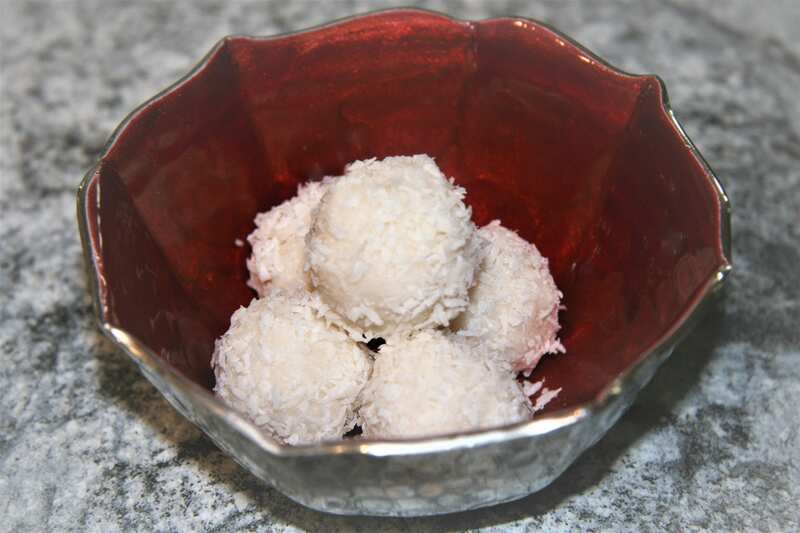 Maple Coconut Balls ('Ladoos' for Diwali) - Wholly Delish! These Maple Coconut Balls are simply simple and simply delicious! My boys and I make these every year when we celebrate Diwali. The recipe is quite a departure from the traditional Ladoo, but yet still traditional in their coconut flavour. We make a big batch, roll them in to small bite sized balls and package them in decorated boxes to give as gifts for family and friends – an Indian tradition when visiting during festivals. The nice thing about these Maple Coconut Balls is their utter simplicity. Three ingredients in a food processor, chill then roll in more coconut. They’re that easy! These are not just for Diwali however. They make a lovely bite sized treat as a snack or a light dessert any time of year! And, while they’re obviously not quite ‘healthy’, they’re certainly lower in sugar and fat than you’d expect given how scrumptious they are. Add 1 cup of the shredded coconut, the maple syrup and coconut oil to a food processor. Pulse until combined. Spread mixture into a small pan or on a plate and refrigerate until solid (approximately 1 hour). Use a spoon to scrape/scoop bite sized amount and then roll with your hand into a smooth ball. Roll in remaining coconut, pressing slightly to coat.